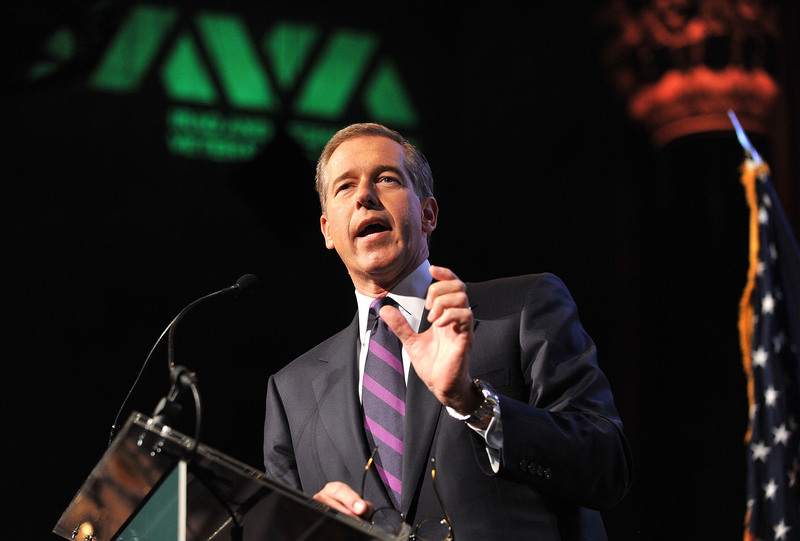 NBC "Nightly News" anchor Brian Williams says he falsely recounted a story that he was in a helicopter that was hit by ground fire in Iraq in 2003 in part because he was "scared" about the events that were unfolding around him. An interview with Star and Stripes newspaper conducted last week and published Monday provides a more detailed look at the embattled anchor's recollection of the events 12 years ago. Williams, who backed out of scheduled appearance on David Letterman's "Late Show" on Thursday, is stepping away from newscast as the network looks into the anchor's claims. Williams, who has apologized for telling the false story, told Stars and Stripes that being a "scared" civilian made his recollection of events far different that the soldiers he was covering. "Adding to the fear of the moment was the fact that we unhooked, our load master let loose a huge, our cargo, so you go through this over-torque where you rise in the air before you settle, despite what was some dandy piloting by the crews of all three aircraft," Williams told Stars and Stripes. "It was like landing on the surface of the moon. And I'm going to have a far different recollection than the professionals." Williams said that he "assumed" that the Chinook helicopter he was on was just one of several that was damaged by ground fire. "I don't know what screwed up in my mind that caused me to conflate one aircraft from the other," he said. "The fact is, I remember three aircraft going down. I was on one of them." Williams told the false story on the air recently during a story about Tim Terpak, an Army officer who he had befriended when Terpak was assigned to protect the NBC crew. Williams told Stars and Stripes he was "very frustrated" that his false account would undermine his effort to honor the veteran. "Anything that takes attention away from him [Terpak], anything that ends up not honoring the veterans is a failure on my part," Williams said. Stars and Stripes previously quoted Lance Reynolds, the flight engineer on the crew that rode with Williams, as saying that "it felt like a personal experience that someone else wanted to participate in and didn't deserve to participate in." Weekend anchor Lester Holt is filling in for Williams on the "Nightly News" for at least the next several days.